It seems that a HUGE number of Kickstarter projects have launched in the last week or so. Spanish company Davale Miniatures are looking to produce 28mm resin miniatures – ‘Riders of the North’. Interestingly, they are looking to only produce figures that will be exclusive to Kickstarter backers, and will not be available after the campaign. Hmm, interesting. They are currently just over 20% of the way towards their 5,000 EUR funding target, with the project running until 1st December. Delivery is scheduled for April 2017. OK, this is probably one of my favourite miniatures game Kickstarters of recent months. New Zealand company Flytrap Factory, who are probably best known for the 15mm figure packs they produce for Skirmish Sangin scenarios, have launched a project for a new range of 28mm figures, entitled Caveman vs Wild. This is a pre-historic hunting adventure survival game, with cartoon design seemingly inspired by films such as ‘Ice Age’. In short, this is lovely. The project has hit about 75% of its $6,000 NZD funding target, and is running until the 23rd November. Delivery is due in April / May 2017. You know you are going to need a Squirrel Rat, don’t you? At time of writing, this project has exceeded it’s £3500 fund goal by just over £1,100. It’s running until 30th November, with delivery due in January 2017. Goblin King Games are launching a new fantasy skirmish game with some very unusual miniatures – Moonstone. Several of these miniatures are very reminiscent of the creatures we saw in films such as ‘Labyrinth’ . I.e. they have a very ‘Jim Hensen’ look to them. This game looks really interesting, and the project has been a big success, raising over £42,000 of an initial £16,000 funding goal. You’ll have to hurry though – the project finishes on the 9th November. Delivery is due in August 2017. Broken Egg Games are producing a set of 2D neoprene terrain tiles with an accompanying terrain mat. They are offering several sets with a ‘Wilderness’ theme, including woods, ruins, mystic circles and a village. The basic mat is 30″ x 30″, but this is upgradeable to a larger size, should you wish. The project has already hit 120% of it’s $10,000 funding target, and is running until 22nd November. Delivery is due in March 2017. For all you 3D printed terrain fans out there, Anthony Selley is producing an STL file for a 15mm building of La Haye Sainte for Waterloo. The project is currently 150% funded, and is due to run until the 30th November. Delivery is due in December 2016. Another 3D print terrain Kickstarter – this time from Swedish company Terrain 4 Print. The subject matter is a bit diverse: a Viking Village, or a sci-fi barracks. Each set of STL files come with several different sections to give the buildings a lot of variation. The prject is already 1500 KR past its 7,000 KR funding goal, and is running until December 2nd 2016. Delivery is due in January 2017. Here is a really interesting bit of design – Ross Kearns is offering a set of MDF laser-cut jigs which will enable you to make hex terrain from expanded polystyrene using a hot wire cutter, getting a uniform finish every time. It’s a brilliant idea. The project is already over 500% funded and is running until the 3rd December 2016. Delivery is due in March 2017. 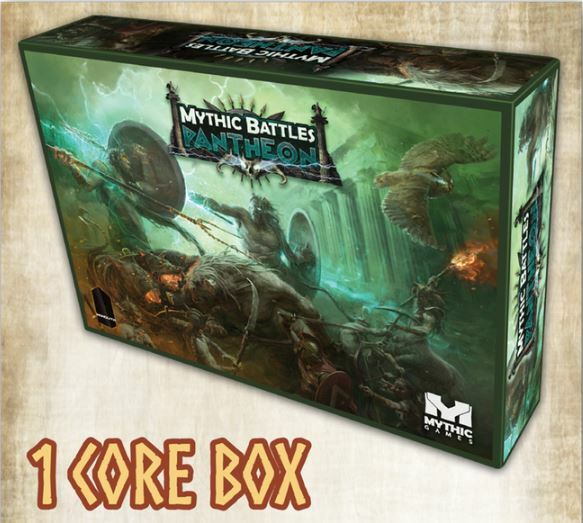 Hot on the heels of delivering the Conan Board Game, Monolith Board Games have teamed up with Mystic Games for another Miniatures boardgame, this time based in Ancient Greece. 2-4 players each take a warband made up of Ancient Gods, Heroes, Monsters and some lesser troops to do battle across various parts of the Ancient world. This is a skirmish game with some very impressive looking plastic miniatures. The project has already reached over 600% funding (based on a $80,000 goal) in it’s first 5 days. The project is running until the 1st December, with delivery estimated for December 2017. Destiny Horizons are currently funding a miniatures boardgame called Destiny Aurora: Renegades. This game will allow players to be playing out a planetary mission whilst simultaneously fighting a space battle overhead. The game uses characters from the Destiny Aurora series of novels. This project has just reached its $35,000 funding goal, and is running until 8th December. Delivery is due in April 2017. Flying Frog Productions – those people behind such titles as ‘Last Night on Earth’ – have launched the latest in their ‘Shadows of Brimstone’ games: Forbidden Fortress. This cooperative dungeon game is set in Feudal Japan, but a world where Japanese fantasy creatures exist. It’s designed as either a stand alone game, or can be used in conjunction with other Shadows of Brimstone games. This project is already hugely successful, having hit 1300% of it’s $50,000 funding goal with 24 days to go. It’s running until the 1st December, but delivery is not due until March 2018. Here’s another one for the 3D printer owners – Rough And Tumble is a hex-based version of chess, but the miniatures that you print yourself. An interesting concept indeed. The prject is being run by Italian company Cross Lances, and has just reached its 500 EUR funding goal. The project is running until 27th November, with delivery due in April 2017. This is one of those ‘I didn’t know I needed one of these until I saw it’ type of accessories. This is a painting guide designed so that you can paint facings on miniature bases, and be sure to get them exactly the same every time – just what every OCD gamer/painter needs. The project has reached 50% of its modest $250 funding goal, and is running until 3rd December with immediate delivery.